On page 179 of R. D. Kloppenburg’s World of Hoyas you’ll find a black & white picture of leaves from the same plant as the one scanned here in natural colour. On page 179 of the same publication you’ll find the above picture of the flowers Mr. Kloppenburg alleges bloomed on the same plant. Above is a picture (taken by George Slusser) of the flowers that actually bloom on this plant. Note the pointed outer tips on the corona lobes in this picture and compare them with the rounded to almost cordate outer tips on the corona lobes in Mr. Kloppenburg’s picture. There is some doubt about the identity of this plant. An Englishman (Mr. Malcolm Symonds) identified it as Hoya obovata for me back in 1980. He was sure of it’s identity because, he said there was a picture of it so labeled hanging in British Museum. Others claim this is a hybrid between Hoya kerrii and Hoya carnosa. I wrote scores of letters to people all over the globe trying to learn if anyone had any clue as to the source of this plant and why one grower (and only one at that time) alleged that it was a hybrid. The only person who replied was the seller who sold it as a hybrid. His reply was that he knew it was a hybrid because, “It looks like a hybrid.” Well, I haven’t lived as long as he but I’ve lived a long time and I’ve seen a lot of hybrids and the only way I can distinguish between hybrids and species is by the labels placed on them. I’ve seen very similar herbarium specimens (all unidentified) and I’ve also seen at least one specimen (unidentified) that looks somewhat the same except that the indentations on the leaves were deeper and were present on all the leaves on that specimen. It is difficult to know what normal is from one specimen that has no field notes attached. Decaisne’s name publication said of the leaves, “apexes rounded or rarely emarginate.” That certainly fits the plant above. He said of the corona lobes, “somewhat rhomboid with a navel-like depression.” That fits the plant in George Slusser’s picture. I believe this to be the correct identification for this species. My point in writing this is to show you that Mr. Kloppenburg’s flowers did not bloom on this plant. I’ve grown this one since 1978 and it has been one of the most reliable bloomers of all. Mr. Kloppenburg erred in matching flowers to plants. The flowers pictured on page 179 of World of Hoyas DID NOT bloom on the plant pictured on page 179 of World of Hoyas. Decaisne, Joseph, DeCandolle, Prodromus Systematis Regni Vegetabilis 8: 635 (1844). Miquel, F., Flora Indiae Batavae 2: 519 (1856). PROOF: As the old saying goes, “The proof is in the pudding.” When your plant blooms you will be able to see that I am correct. I have read, with grave concern, the statements made by Mr. Ted Green in Fraterna 16(1): 10 (Jan.-Mar. 2003). Mr. Green has painted the USDA as villains, out to stifle free trade by imposing the law on him. He writes as if the USDA suddenly passed a bill requiring all plant material that enters the US be accompanied by a Phytosanitary Certificate issued by the country in which the plant material is collected. Mr. Green would have us buy his propaganda that this is something new. IT IS NOT. This has been the law for as long as I’ve been collecting plants from overseas. I have in my file a copy of the law sent to me when I first applied for an import permit back in 1970. I have also, in the same file, updated copies from as recently as May 2003. The wording of the law hasn’t changed except that an extra permit (CITES) is required if one wants to import plants which are on the Endangered Species List. The CITES requirement became law at least 25 years ago. Mr. Green also said that obtaining the required Phytosanitary Certificates makes $10 worth of plant material cost $100. Friends, Mr. Green never (and I mean NEVER) collected only $10 worth of plant material. When one can go out on a collecting trip and come back with a dozen different species and immediately put out a new catalog with all of those new species listed, one can be sure that he collected a lot more than $10 worth of cuttings. I say that because my experience as an ex-dealer of hoyas is that the higher the price the more anxious hard-core collectors are to buy them. At the prices he charges for even old things he’s listed for 30 years, he can well afford to pay $100 to travel the extra distance required to obtain a Phytosanitary Certificate. I interpret Mr. Green’s ranting and raging over the unfairness of the law as that the law has finally caught up to him and has finally been imposed on him in the same way it has always been imposed upon the rest of us. What’s happening here is in the same category as my getting my first speeding ticket (which cost me $75) i. e., “They finally caught me speeding but it took them 40 years to do it!” I paid the fine without complaint. All of us can get away with breaking the law sometimes but eventually it catches up to us and all we can do is pay and be glad they don’t make us pay for all the times we got away. I also interpret Mr. Green’s ranting and raging as a prelude to his raising his already ridiculously high prices even higher. When he does, I hope to be spared hearing more of his complaints about having to use a machete to keep his hoyas under control due to their growing like weeds and taking over his yard! The man may be “Crying on the Outside” but he’s “Laughing on the Inside” --- all the way to the bank with our money! The law that requires all plant material imported into this county to be accompanied by a Phytosanitary Certificate is NOT NEW. It is just finally being enforced on him the same as it has been enforced on you and me all these years. I say, “IT’S HIGH TIME! Letter #1: Dear Cuz, I’ve missed seeing your letters on Garden Forum and wonder why? I’ve been thinking of joining that group. Do you think I could learn something there? --- C. Hornsby. Reply: I’m no longer writing on Garden Forum because I got kicked off for being honest and for calling its omnipotent leader what I think he is. Anyone who knows anything about hoyas isn’t tolerated there because it might show up his resident authorities, who know less than nothing about the subject. It only proves that H. L. Mencken was right when he wrote, “No one ever went broke underestimating the intelligence of the American people.” If I had written that, I’d have left out the word American, as there are a couple of Europeans on that forum that fit in the same mold. Letter #2: I read the following letter on Garden Forum and wonder why you never told me that there is such a book: “Where can I purchase a copy of Kloppenburg’s Dictionary of Hoya Terminology? Just like that person on GW forum, I want it so I can learn the correct pronunciation of Hoya names. – C. Hornsby. Reply: Didn’t you read your copies of The Hoyan in which I did mini-reviews of what you’d find in that book? Kloppenburg did NOT give correct pronunciations of hoya names in said dictionary. In fact, he made no attempt at all to tell you how to pronounce hoya names. He only made a stab at telling you how to pronounce words found in hoya name publication, which you aren’t likely to ever see unless you read some of his publications or go to a botanical library and do a lot of research. Then you aren’t likely to find them in anything Mr. Kloppenburg wrote because Mr. Kloppenburg can’t spell. Almost all of the definitions in said dictionary are incorrect. Some are hilariously funny. If you’d like to know what is in this “dictionary” (which I have subtitled “The Dictionary of Kloppenburgese”) send me $3.85 for priority postage in US and I’ll send you a CD (add 67 cents to cover cost of CD).. This CD will tell you how he defined words and then tell you the correct definitions of the same words. It will also tell you where you can find the correct definitions so that you can check my accuracy if you wish. You have my permission to copy this CD and give it to anyone you wish (as long as you don’t sell it)..
Letter #3: Dear Cuz, I read a letter on the same forum noted in my previous e-mail where someone was ecstatic over receiving a copy of Kloppenburg’s Philippine Hoya Species and, judging from your reply to my inquiry about the dictionary I’m assuming you have nothing good to say about it so, please, tell me what’s wrong with it before I invest too. --- Your cuz, C. Hornsby. Reply: You guessed right. Funny about this, his first book, is that he didn’t proof it until after it was written and had been mailed to purchasers. Several weeks after receiving the book, a letter came to the person who purchased the book for me, which stated that “While proofing it two errors had been found so if you’ll return the book, we’ll send you a corrected copy “ (Didn’t even offer to pay the postage to return it). I’d already found more than 2,000 factual errors in the book and my friend, the late Hon. Douglas H. Kent, found an additional 250 that I’d overlooked and he’d only read 23 pages of it before giving up and putting his copy in the rubbish bin. Yet Mr. Kloppenburg had only found two errors. The first one he found was on the cover. He’d misspelled Philippine, which was really surprising as his wife was (is?) a Philippine native. The second error he found while proofing it was in the last sentence in the book, which read, “Their (sic) is no ending to this book, only a pause in order to do some more collecting, this study will continue as long as their (sic) are collection sites to be explored.” Now I see more than a single error in that statement. 1). It’s two sentences, not one. A period, instead of a comma, should be between the words collecting and this. 2). The first word in the statement should be “There, “ not “their.” 3). The word “their” in the phrase “as long as their, “ should also be “there.” To those for whom English is not their native tongue, the word “their” is the possessive pronoun, which means, “belonging to them..” There is a pronoun that denotes a place, a situation or a condition, as. “There are many trees in the forest;” “There is a storm heading this way;;” “It is over there;” etc. And while I’m at it, let me define “they’re.” It’s a contraction for “they are.” Mr. Kloppenburg used the words, their, there, and they’re interchangeably throughout this and all of his books. When the original copy was recalled, I chose to keep the “uncorrected” copy because I refused to spend another cent on it as I’d have had to do to mail it back and also because I wanted to be able to prove when someone told me those errors never appeared in the book, that they did. Every page of the book contains from a minimum of a half dozen up to as many as 45 misspelled words. Almost every cited title is either misspelled or just downright wrong. Almost every author’s name is misspelled. Mr. Kloppenburg has updated this publication and added to it. The updated copy has errors in the few places where he was right in the first edition. It is filled with contradictions and also contains statements and pictures that are fraudulent, i. e., he labeled a number of his own illustrations as being those taken from herbarium species that no longer exist and haven’t existed for more than 50 years. Save your money! A page by page, line by line, list of errors and corrections is on the same CD with the dictionary critique (see above). Before you ask me about Kloppenburg’s Handbook and The World of Hoyas, a critique of it is on the same CD with two above. Included on the CD is also a critique of a single 5 ½ line paragraph from one of Mr. Kloppenburg’s books in which he made 38 factual errors in that single paragraph. There, among other things, he moved a lot of Thailand communities from Thailand to India. Be warned! Don’t ever ask directions of this guy and don’t ever hire him as a guide! Mr. Kloppenburg needs to say a prayer of thanks every day of his life, to the God he says he doesn’t believe in, that he world isn’t flat. If it were, with his sense of direction he’d have fallen off a very long time ago! 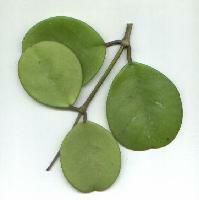 Kloppenburg just republished Hoya chlorantha var. tutuilensis again, calling it Hoya fetuana this time. Don’t let the spectrum red flowers in his cover picture mislead you. Print a mauve or purplish hued balloon on Kelly Green paper and it will come out looking spectrum red too. This publication was illustrated with 10 colour pictures of various flower parts, of which one of his critics wrote to me and said, “Every picture looks like a piece of scrap from a Teddy Bear that a pack of dogs fought over.” Mr. Kloppenburg should have used a dye to colour those flower parts. My observation is that each flower part absorbs dyes differently so that when photographed it is easier to tell where one part stops and another part starts. Mr. Kloppenburg’s over exposed pictures appear to be mostly just big globs of yellow. Having seen a duplicate of one of the two numbered specimens he cited, I know how these parts really look and that is why I’m sure that this plant is Hoya chlorantha var. tutuilensis. Even if this new publication were not a previously published species, I believe it will be declared invalid due to the incorrect herbarium citation and to the incorrect holotype number cited in the Latin portion of this publication and the entirely different type number cited in the English portion of his publication, however the powers that be surprise me frequently. 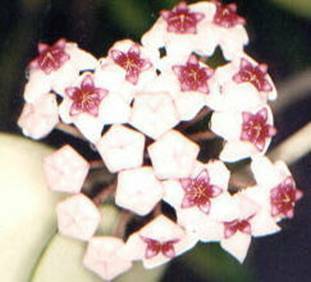 A lot of people have told me that they feel cheated because of Mr. Kloppenburg’s fixation on hoya coronas. Seems that every time he’s hard up for something to write, he once again, still again, and over again launches a treatise on hoya coronas. How many times will his subscribers have to endure this? And when will he ever learn that an anther appendage is not the anther itself? Note that he has them so labeled in his illustrations. Not many should be misled in that area though because his illustrations here are also just blobs of yellow with no clear outlines of any of the parts. An article on hoya leaves by Mr. Green is included. Mr. Green’s fixation appears to be leaves. This is a subject he covered before. This time it’s a comparison of the leaves of Hoyas darwinii and mitrata, plus a couple of dischidias. Mr. Green’s knowledge of the leaves and growth habits of the two hoya species he wrote about is extremely flawed. For example, he wrote of Hoya mitrata’s abnormal “cabbage leaves” saying, “Hoya darwinii roots readily along the stems, in contrast to mitrata that roots only at a cabbage.” That statement is simply not true. Several years ago, Chanin Thorut of Bangkok, Thailand sent me about 50 cuttings of Hoya mitrata to sell to Hoya Society International members. Chanin wanted to send them flat in order to make them fit into flat rate priority envelopes, which would save a lot of postage as he could get all into just a couple of envelopes. He sent only cuttings containing normal leaves as the “cabbage-looking” clusters would have taken an enormous box and many times as much postage. All of the normal leaf cuttings sent by Chanin Thorut rooted and grew. Mr. Green then went on to say, “I have noticed that Hoya darwinii produces more roots (and tenacious ones!) at the cabbage than Hoya mitrata.” That statement is “whole cloth and a yard wide.” Hoya darwinii does NOT produce “cabbage” leaves. It’s modified leaves are of an entirely different sort. It has mostly normal leaves. By that I mean leaves that look like leaves. After growing long stems with many pairs of normal leaves something unknown causes the lateral leaf margins on a leaf (and on its opposite mate) to stop growing while the rest of the leaf continues to grow normally. This causes the leaf to roll up into a ball, which looks very much like a green golf ball but open at one end and on the margins. The rolling-up of the leaf creates several chambers inside. Ants build nests in these chambers. Roots that are formed at the nodes next to these “green golf ball” grow into the balls where they receive nourishment from ant waste and from rain water that collects inside the balls. Only two leaves are ever involved at any node though many would be required to make a “cabbage” such as found on Hoya mitrata. I feel very fortunate that I have actually had a set of modified leaves on my Hoya darwinii (the plant I lost in that 1983 freeze). I feel very unfortunate that the pictures I made of it were lost when I moved out here to the lake, along with a lot of other pictures I can’t replace. If you’d like to see a picture of this species with a pair of those “golf-ball” leaves attached, there is one in the NY Botanical Garden’s Illustrated Encyclopedia of Horticulture, Vol. 5, page 1726 (1981). Your library may have a copy. The copy I made at the library isn’t good enough to use here. Look it up. Here is how Loher described the leaves of Hoya darwinii when he published the name: “Leaves dimorphic, the one normal elliptic oblong (15-20 cm. long X 5-6 cm. wide) glabrous, leathery, nerves not conspicuous, shortly petiolate; the other with shortened edges all over, recurved backwards 2 to 3 times and at last forming a globose pouch, having 4 to 6 cavities, well closed, ant’s habitation.” That was translated for me by Michael Madison, former curator of the Marie Selby Botanical Garden. So much for its having a cluster of leaves that look like a head of cabbage. If Mr. Green’s does, I like to suggest that perhaps his plant is not the species he thinks it is. ---- So what’s new?